WOW! What a great resort!! I've stayed at MANY resorts and none has ever been like this. The food we ate was good. Literally, everything you eat is great. The rooms are clean, the staff is nice, there's SO much to do. I highly recommend this resort. We've been to this hotel 6 times and it's hard to go anyhwehre else because the luxury and service is unparalleled. We loved the infinity pool. Our room was comfortable. Our view was only so-so for an ocean view. Sprawling resort in the jungle. Great beach and pool. Food and drinks were good. Toilet was consistently leaking; balcony sliding door was loose and made noise when windy. Other than that, beautiful grounds and super friendly/helpful staff. Buffet was great! Snorekling right at the beach was amazing, the crystal clear water with safe spots to swim. The Riviera Maya is an area of natural beauty along the Caribbean coast of the Yucatan Peninsula. Originally it was a hub for religious activity and trade, with remnants of its past still present in the ruins of Tulum and Playa del Carmen. To step back in time, tour an archaeological dig and uncover a piece of ancient Mayan civilization. Cozumel, a major hub, began as a ferry stop, but its sandy borders, quaint villages and attractive reefs turned the area into a popular vacation destination. Divers from all over the world come to Riviera Maya to explore the Great Mayan Reef, the world's second-largest reef system. Uncover a secret cave among the hidden underground river system or simply relax on one of the gorgeous beaches. The beaches along the Riviera Maya are filled with pristine white sand and turquoise water. Puerto Morelos is the main beach in the middle of town. With its serene atmosphere, it is the ideal place to gather your thoughts. Akumal, “Land of Turtles,” is another beach spot filled with interesting and unique wildlife. The peaceful and crystal-clear water makes it a snorkeler's paradise. It is simple to grab your scuba mask and uncover the hidden world, or you can simply watch others dive into the underground rivers and explore the coves from the comfort of a boat. There are various archaeological sites throughout the Riviera Maya. The Tulum is one of the most popular archaeological attractions in the area. Numerous tours are available to explore this ancient city where monuments and temples abound. To get a good sense of Mexican culture, participate in a traditional Mayan sweat lodge ceremony. This type of event is often held in many of the local resorts. Riviera Maya holds a wide range of shopping options, from unique boutiques to roadside markets. Playa del Carmen is at the center of retail therapy in the area. It is home to Fifth Avenue, a pedestrian street that is packed with high-end shops, souvenir stores and stalls filled with handcrafted items. Do not be afraid to try for a bargain; most shop owners in the area enjoy haggling and discussing their wares with customers. At Playa del Carmen, you will be able to find great deals on chocolate, tequila and jewelry. Sterling silver is quite popular in the region, but make sure to purchase pieces from a legitimate store. A bit further north, you will hit the town of Puerto Morelos. Here, local handcrafted items are reasonably priced. You will find beautiful paintings, carvings and blankets. The Riviera Maya has undergone a culinary renaissance. Guests enjoy new restaurants and emerging chefs. Gourmet dining options are becoming readily available at Playa del Carmen and the Hotel Zone. Travelers flying to the area tend to arrive at Cancun international airport (CUN). It’s one of the busiest airports in the Caribbean with transport links to Playa del Carmen, 32 miles to the south. Cozumel Airport (CZM) also offers international connections to the region. Many travelers tend to take advantage of all-inclusive resorts that offer free meals and other great amenities. 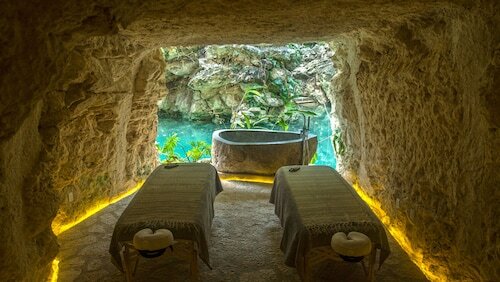 However, there are smaller Riviera Maya hotels as well. These places offer Caribbean charm, traditional hospitality and Mexican style. The Riviera Maya is very ethnically diverse, and the area hosts numerous festivals. The “Day of the Dead” is celebrated by the locals who gather in cemeteries to keep the souls of the deceased company. Xcaret hosts a large celebration filled with fine food, art exhibits, live music and energetic dancing to commemorate this day. Other events include the Riviera Maya Jazz Festival and the International Movie and Food Festival. July and August are the busy months, and prices reflect that fact. The rainy season occurs May to December. Most ruins remain covered during this time. 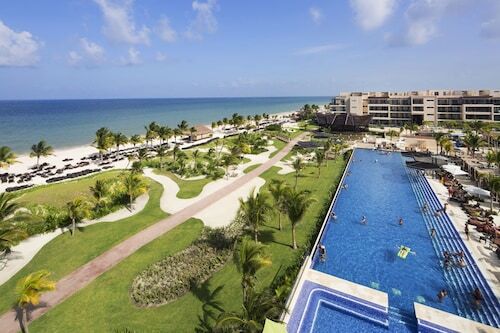 For the best weather, consider visiting the Riviera Maya December through April.